The OSU South Centers, in partnership with OAA and University of Wisconsin–SP, have successfully started the second year of Aquaculture Boot Camp-2. The program offers a multi-faceted approach, including classroom and hands-on training, paired with industry mentoring to enhance the sustainability of new and beginning aquaculture/aquaponics and next generation farmers in the Midwest. In 2018, we are running parallel 3-I level (Intensive, Intermediate and Introductory) ABC Programs in Ohio and Wisconsin. The ABC-2 2018 Intensive class consists of 35 highly motivated fish farmers and aquaponics producers from across Ohio and West Virginia. The individuals selected consist of educators, business owners, researchers, students, and more – offering a broad spectrum of experience and knowledge. The kick-off session and classes were jump-started in February after January classes’ cancellation due to a heavy snow. The session offered the students and their business collaborators an in-depth look into aquaculture/aquaponics production planning, business plan structures, and market identification. 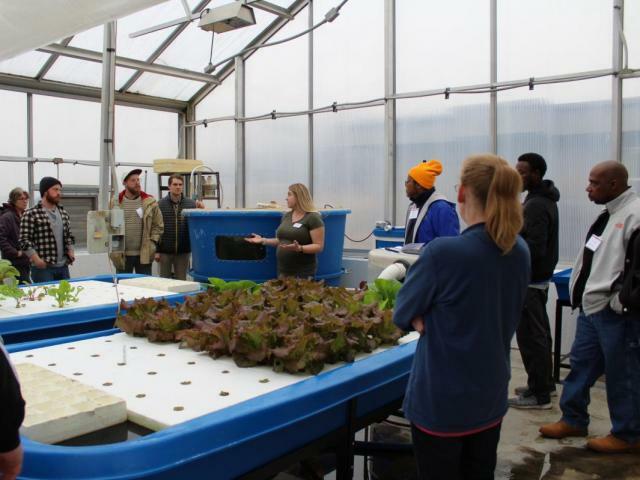 The students toured the OSU South Centers’ newly updated aquaponics system and aquaculture research facility, where they will be actively involved throughout the year. In March, ABC-2 students traveled to Fresh Harvest Farm, owned by Doug and Jeni Blackburn, for a tour of their aquaponics facility and a full day of learning. Matthew Smith, aquaculture extension specialist, covered key principals of aquaculture and aquaponics in the morning while guest speaker Brad Bergefurd, horticulture specialist at the OSU South Centers, taught plant selection and considerations in aquaponics. The afternoon breakout sessions focused on harvesting, packaging, legal considerations in aquaponics, and system components and construction, as well as successful fish husbandry practices. In April, the third session held at the OSU South Centers combined business and biology. Hannah Scott, the CFAES Center For Cooperatives manager, gave an overview of cooperatives and their structure, while Brad Bapst, the Small Business Development Center Director, dove into cash flow. The afternoon breakout sessions offered the students a hands-on opportunity to learn about yellow perch spawning, artificial fertilization, egg ribbon incubation, fry estimation and stocking, and pond fertilization instructed by South Centers aquaculture research staff members Paul O’Bryant and Dean Rapp. Matthew Smith introduced RAS and Biofiltration to the students and walked through the South Center’s aquaponics system design. The OSU South Center ABC-2 team has a plan for future sessions throughout the year and looks forward to bringing the ABC students the most up-to-date industry information and practices. An extensive Aquaculture/Aquaponic Boot Camp-2 agenda was developed with 12 workshops to be offered during 2018. Thirty-six applicants, all interested in starting an aquaculture or aquaponics business, were selected to participate in the ABC-2 Intensive program. Attendance at the first four workshops has been around 90% with each participant also developing a pilot project that they discuss at each workshop. Final project presentations are scheduled for January 2019. Three of the four business and marketing workshops have been scheduled or took place in 2018. At the March 3 ABC-2 Intensive workshop, presentations were given by the WI Small Business Development Center, where assistance by the Center was discussed in addition to an introduction to marketing and how to access publically available marketing research/data. On August 13-15, the University of Wisconsin-Stevens Point (UWSP), Nelson & Pade, Inc. (NPI), and the Wisconsin Aquaculture Association (WAA) will host a three-day workshop that will focus on the fundamentals of aquaculture/aquaponic business and marketing. Attendees will be introduced to small business concepts and how to navigate the myriad of rules, regulations, permits, business and loan applications, and zoning and marketing approaches. Following that event, on August 18, a business and investment opportunities in aquaponics workshop will be hosted and provided by NPI. This will be a one-day course for entrepreneurs, investors and individuals interested in starting an aquaponics business. The course will focus on the start-up, planning, operation, economics, marketing, profitability, ROI, and business models for commercial aquaponic ventures. The WAA, NPI and UWSP Aquaculture/Aquaponic programs selected six interns and paired them with established farms. The established farms have entered into a cost-sharing agreement with UWSP and have developed a rigorous, yet well-defined educational and training program for the interns. Each internship is taking place from May 29 – August 31, 2018 and is allowing the interns to apprentice and learn important aquaculture/aquaponic information provided by the producer, who also serves as the intern’s mentor. The UWSP aquaculture/aquaponic websites (aquaculture.uwsp.edu and www.uwsp.edu/aquaponics) and Facebook pages are being used to distribute information on aquaculture/aquaponics for new and small rural farmers. Support is being given to the WAA to update their website (www.wisconsinaquaculture.com) and NPI recently updated their website (www.aquaponics.com) to be more user friendly and contain updated information. Discussion and initial plans have been developed to update the WAA newsletter, The Creel. ABC-2 intensive training and workshops are being digitally recorded and uploaded to the UWSP ABC-2 website (https://www.uwsp.edu/cols-ap/nadf/Pages/Aquaculture-Boot-Camp.aspx) and will also be made available through the OSU ABC-2 website (https://southcenters.osu.edu/aquaculture/aquaculture-boot-camp). On March 2-3, UWSP and WAA co-hosted the Wisconsin Aquaculture Conference in Marshfield, WI with the conference theme of “Aquaculture 2018: Strength in Numbers – Building the Industry with Collaboration, Training and Education.” The focus of the presentations was to combine private and public aquaculture/Aquaponic operations in an effort to share their experiences for new and limited resource farmers. Also, six interns are being mentored at aquaculture/aquaponic facilities in 2018. A bus tour of a variety of aquaculture and aquaponic businesses is scheduled for August 2018. For more information about ABC-2, please contact Ms. Jordan Maxwell, ABC-2 Program Coordinator, at maxwell.411@osu.edu.